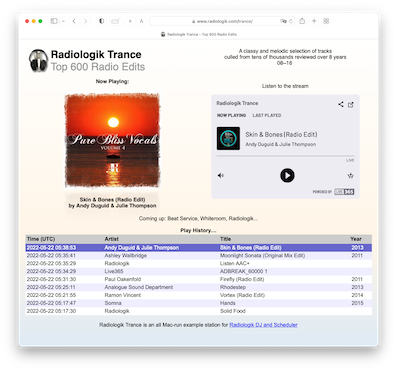 Radiologik is a system suitable for both live DJing and 24/7 radio automation on the Mac that uses iTunes as its database and iTunes playlists as the logical building blocks for sophisticated programming. Radiologik was developed for and is used in LPFMs, NCE-FM, college and high school stations, and online stations. It's also used by radio and live venue DJs, Sirius/XM channels, and is licensed to users in over 60 countries. Fully automated and unmanned stations use Radiologik to pick content by date, intro and outro artists and titles, announce the time, station ID, play podcasts, manage and play advertising by a separate schedule that integrates with the programming schedule, all completely autonomously. 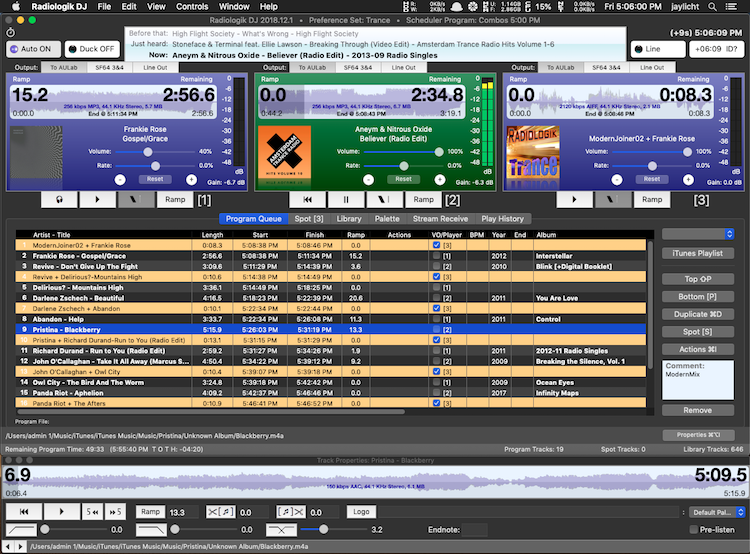 Radiologik DJ can be used by itself as a DJ program for live events. It is also the player Radiologik Scheduler uses to make a full-time automated radio station. Radiologik DJ's primary is the program queue which essentially uses the first 2 players and the third for tight fits and voiceovers. It has 3 on-air players which can be sent directly to 3 distinct audio outputs with the right hardware. You get one more 4th audio output meant for off air used by the library player for previewing and properties player for editing ramp, start, stop, overlap, etc. There's a library you can use to keep either a selection of your iTunes library by keyword or the entire library and search it for requests or sort for an exact time fit song or perfect long ramp so you can do a long talk-in. It will typically import 10,000 in just over 15 seconds or keyword import 1,000 songs from a 15,000 iTunes library in 2 seconds. There are details like if you drag a song into DJ's queue, it brings itself to the front and selects that song to do with it whatever you like. If you have auto off, DJ brings itself to the front as you get within 20 seconds of the ending of a song. Dialogs that would interfere with operation are used very sparingly. The idea is to keep it simple enough that you won't mess up on air when you're really thinking about other things like what you're going to say. You can use the scheduler to run a 24/7 automated terrestrial or internet station. Basic and Advanced features are the same download and can be switched from the application menu. It uses iTunes as its database utilizing playlists and particularly smart playlists for song selection with its own top logic using a weekly schedule. Radiologik Scheduler Advanced is a mode for scheduler which further supports voiceover intros and outros for specific tracks, artists, albums. It includes support of scheduling spot/ad flight runs, date matching filenames, and time announcements and sells for just $96.00. Either mode, same program, is always available to download and try. 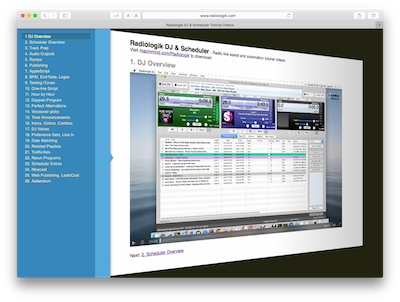 To learn more about Radiologik DJ and Scheduler, visit the Radiologik video site for 4+ hours of overviews and comprehensive tutorials. It's easy to get started and as your wants get more sophisticated you'll find so much has been thought of and done. 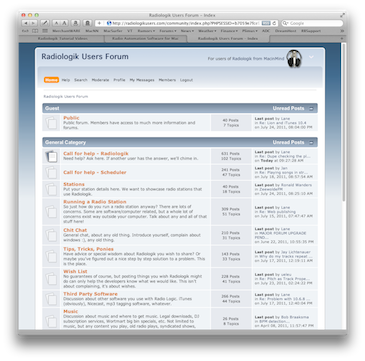 Visit the independently run Radiologik Users Forum to exchange tips, get peer help, and discuss radio and Mac issues with other Radiologik users. that uses Radiologik in combination with LadioCast.